At approximately 21:00 hours Friday, Roskilde Festival made contact with alien life. Ten minutes prior to the incident, a dense and eager crowd took refuge in the cavernous tent of the Arena stage, seeking refuge from the ongoing storm outside. A sour haze of steaming rain jackets and cigarette smoke hung in the air. Fog machines oozed on stage – just enough to conceal five figures as they slipped into position. Then, the extraterrestrial encounter began. Distorted, ethereal synths drawled as shimmering spotlights scanned the stricken crowd, a white light diffused in the thick hot air. Silhouetted against these flares stood the five faceless players – rather, electronic multi-instrumentalist Trentemøller and four disciples. The native Dane traces his musical roots back to experiments with indie rock in the 1990s, then evolving into an an accomplished, adaptive electronic artist in the mid-2000s. 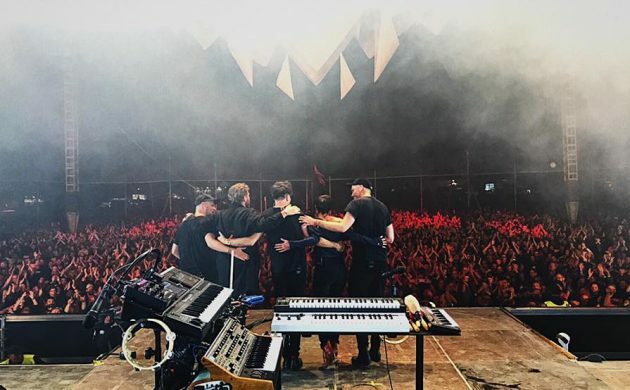 Now on his fifth appearance at Roskilde Festival, his cross-genre style is a mesmerising hybrid of synthwave, minimal electronic and alternative pop. Trentemøller’s opening drew heavily on ambient and synthwave, with pulsing bass and retro-cyber synth loops hitting with spellbinding repetition. A rich blue light cast across the crowd in this induced ambiance – the hypnotic draw of an alien craft’s tractor beam. The trance state was constant through Trentemøller’s performance, and by no accident. His performance as a whole was remarkably well-orchestrated –Trentemøller used every element of the stage to emphasise and enhance his music. Spotlights, LED displays, bass notes and tempo knobs all become tools to tweak and guide the audience’s energy, as Trentemøller drives the show through strata of emotion. It’s a gross-genre ride, skirting slower trip-step tracks along with furious drum and bass drivers. For some tracks, shuddering bass and pulsing crimson stage lights stir the crowd into an orc-like frenzy, as Trentemøller explores harder numbers that flirt with metal influences. Yet as soon as it erupted, the chaos subsides: cool blues and a plodding, slumbering rhythm transform former barbarians into glazed-eyed, head-bobbing drones. Trentemøller’s audio hypnotism never rushed and never dragged, interjecting lulls of alien-stasis between bright bursts of high-tempo mania. It was a sustained energy, and one that wisely budgeted strength reserves for the show’s thunderous conclusion. After some 30 minutes of near-constant music, the lunar rhythms dropped off and stage lights cut, leaving the audience in brief, anticipatory darkness. Suddenly, a phosphorous white flare lit up, followed by furious red lighting and a bellowing drum beat like a call to war. Cinematic, hellish guitar riffs drag the entranced audience through a volcanic odyssey, sparking fevered dancing throughout the tent. As the concert went on, Trentemøller and company would occasionally step out of their shrouded perches for brief, celebrated solos. The moments were few, however, as anonymity was the dress code for the group. The limited faces and motions to follow on stage allowed more attention to the music – a shift of focus that was perhaps a factor in the hypnotic nature of Trentemøller’s show. This anonymity only fully dissolved at the full conclusion of their performance –one which pushed an hour in duration and moved an audience in unison. As the last notes of Trentemøller’s driving, techno-rooted finish melted in the rising house lights, the trance released and audience members were finally able to see the five musicians behind the accomplishment. Trentemøller’s show was as emotionally authentic as it was deliberate – the impressive result of dedicated artistry, strategic presentation and unmissable talent.